With Spring in the air are you looking for something fun and different to do? We invite you to come and relax at our Falmouth, Ma bed and breakfast Patriot’s Day weekend (April 15-17) and enjoy all there is to offer. 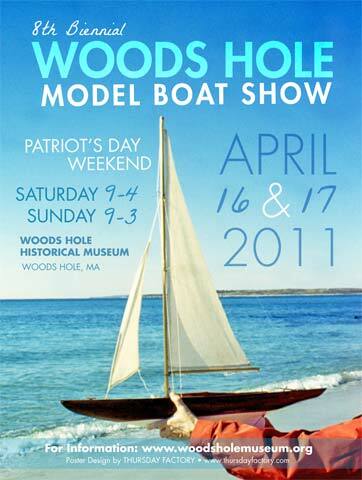 The special event we recommend on the 16 and 17th is the 8th biennial Model Boat Show just down the street in Woods Hole. The show runs from 9 am to 4 pm on Saturday and 9 am to 3 pm on Sunday. There will be over 150 model boats on display including a special tug boat exhibit. There will also be radio-controlled model boat races on Eel Pond. The model boats will be on display in five buildings on Water Street and the Woods Hole Public Library will exhibit hand-crafted boats, including a live demonstration of the restoration of an antique model boat. The Boat Show will also feature a researcher from WHOI’s Deep Submergences Lab and a speaker from the Compass Project GPS Tracked Mini Sailboat Oceangoing Race and Expedition.